where there are a lot of precious metal investors which exacerbated losses taking gold, silver and the junior miners to oversold levels like we have not seen since late 2015. 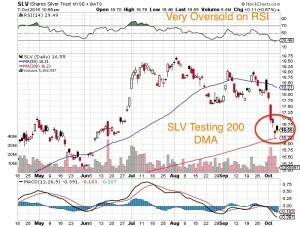 I expect to see a basing around the 200 Day Moving Average which gold and silver have been hitting. This could be great news as that may signal a major secondary buy point for what I believe could be the next major bull market in precious metals fueled by a weak slowing economy combined with soaring government debts and negative interest rates. 1)For weeks I highlighted a small cap new gold miner about to go into production which attracted some of the top minds in the industry such as Pan American Silver's (PAAS) Ross Beaty. I just received news that the company just started production and that concentrate shipments could start in November. Production could reach 52k ounces of gold annually. Management is critical in this business and congratulations goes to the team who acquired the asset from Barrick during the depths of the bear market and put it back into production sooner than expected without increasing the budget in what could be the early stages of a new bull market in gold. 2)I just received the news that one of our top development stories in the Golden Triangle in British Columbia just closed on approximately $9 million CAD. This will certainly help the company get its Feasibility Study completed on one of the top high grade projects in Canada where we have seen so much M&A activity in the past year. The company is having a great summer attracting a lot of capital after publishing an updated PEA in July which showed low cost underground production and capital costs. However, one of the areas which could be improved is mine life where a larger resource is required to be taken out by a mid-tier producer. It seems management has addressed that issue with the drill discovering new high grade gold zones with consistent and impressive high grade drill results which should be continuing through this Autumn. There are few high quality near term producers in Canada and especially in BC's Golden Triangle. 3)For years I have watched this small cap stock blossom from an obscure little Nevada junior to becoming one of the best sponsored gold explorers in Nevada. I had faith in the asset and technical team led by top explorers and financiers. Years ago I highlighted to my subscribers what I believed was the next big discovery on the Cortez Trend which hosts Barrick's most profitable mines in the world. Now amazingly four years later, the company is backed by Barrick, OceanaGold and Toqueville Gold Fund. Those are some of the top sponsors to have as long term shareholders who now control around 100 million shares. I just saw the news that this company arranged a $9 million CAD financing this week which will expand their exploration program with increased rigs on their 38 sq mile land position in the Cortez Trend next to Barrick. Disclosure: I own securities in these three linked companies and they are all website sponsors. Owning securities and receiving compensation is a conflict of interest as I could personally benefit from a price/volume increase. Please do your own due diligence as this is not financial advice! I am biased towards my sponsors (Featured Companies) and get paid in either cash or securities for an advertising sponsorship. I own shares in all sponsored companies. You must do your own due diligence and realize that small cap stocks is an extremely high risk area. Please do your own due diligence! 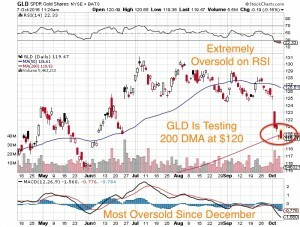 Gold and Silver Pulling Back To Support, Could Fed Meeting Next Week Boost Junior Miners?